Nightshadow, Hook, and other Hellbent Prime worked to exterminate the regular Hellbent. Powers/Abilities: The Hellbent have various superhuman powers, apparently random mutations usually unrelated to their parents' abilities; though some, such as Moon Knight and Nightshadow, inherited their ancestor Seth's ability to absorb life energy from others. See individual entries. The Hellbent's bodies duplicate all human internal organs right down to the microscopic level, but they have genetic enhancements. Traits: The Hellbent are one of Earth's hidden races. Little was seen of the population as a whole, but they seemed to wish to live in peace, separate from mankind. Those serving Seth, however, were bloodthirsty, and they saw humanity as weak. Some of the Tailspin consume human and horse flesh. (Marc Spector: Moon Knight#50 (fb) - BTS) - The Knights Templar existed, in one form or another, since civilization's dawn. By infiltrating all special interest groups -- through third-party agents with no traceable connection to their order -- all significant information filtered back to them. The Templars functioned as the genuine historians of humanity, cataloguing the true version of history, contradicting and threatening the ruling elite. (Marc Spector: Moon Knight#58 - BTS) - Seth was one of the founding members of the Order of Knights Templar. (Marc Spector: Moon Knight#59 (fb) - BTS / Official Handbook of the Marvel Universe A-Z#5) - The Hellbent are a hybrid species dating back to a time when the remnants of previous races still shared the Earth with early man; these interbreedings produced the Hellbent. They became a caste shunned by both human and inhuman sires, and the Knights Templar (or their predecessors) claim they swore a dark promise to the Egyptian god Thoth long ago to protect these innocent Hellbent in exchange for the powerful secrets of the god of wisdom and death -- secrets of wisdom, creation, and death, which were recognized by the Knights as being too powerful for frequent use, and they were hidden away, becoming the core of the Arcane Archives. The Archives were unknowingly guarded by the Hellbent. The Templars "sheltered" their Hellbent wards in a subterranean Hellhole for untold millennia because even they feared their own tainted legacy. Hellhole was established on an extremely fragile magma fault so that any threatening demonstration of the Hellbent's dangerous powers would seal their doom. The Templars secured their own escape options from Hellhole with key teleportals, or Hellgates. (Marc Spector: Moon Knight#50 (fb) - BTS) - In times of trouble, the Knights Templar would break rank and retreat into decentralized sub-groups. (Marc Spector: Moon Knight#50 (fb) - BTS) - The Templars tracked and protected one particular family lineage whose descendents shared a unique genotype (gene-trait) unknown to the majority of them, the house of the collective subconscious of all their ancestors. If catalyzed through a method known only to a few in the Templars, this genotype allowed generational heirs to become the ultimate personification of the Bloodline, with full access to the combined knowledge and singular specialties of their entire family tree. This knowledge included the ability to access the Arcane Archives. The genotype was catalyzed by expression of a certain gland in the neck, followed by the Bloodline's recitation of a certain phrase, "Praeterit est parens ad futurum," which means "The past is parent to the future." (Marc Spector: Moon Knight#50 (fb) - BTS) - The earliest members of the Bloodline lineage swore eternal allegiance to the Knights Templar. 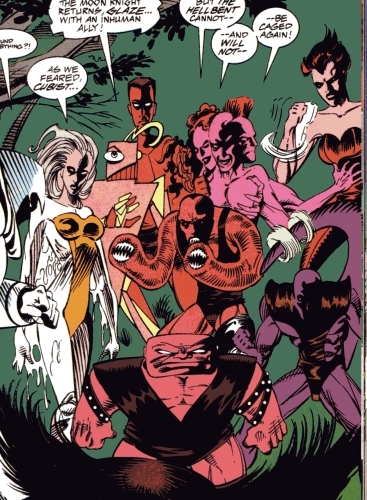 (Official Handbook of the Marvel Universe A-Z#5) - Over time, some of the Hellbent occasionally escaped the Hellhole, which was both shelter and prison. To combat these rogues, the Knights bred an entity known as the Manx to hunt them down. (Marc Spector: Moon Knight#59 (fb) - BTS) - The Manx line was trained to pounce on the weakest targets first. 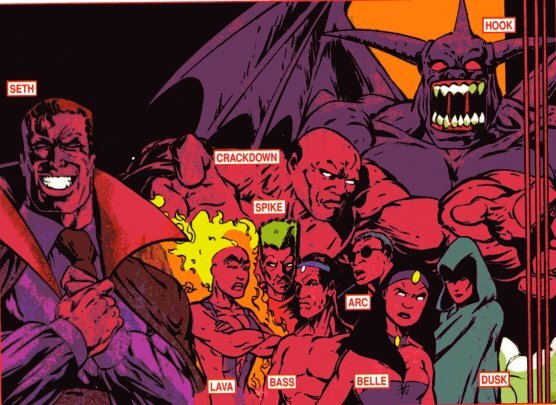 (Official Handbook of the Marvel Universe A-Z#5) - Intermingling between the Hellbent and humanity resulted in a growing element of racism amongst the Hellbent, as pure stock Hellbent Primes began to look down upon the half-breeds among them. This split was encouraged by Seth the Immortal. (Marc Spector: Moon Knight#58 - BTS) - Seth secretly controlled the breeding of a small, powerful sect of Hellbent. 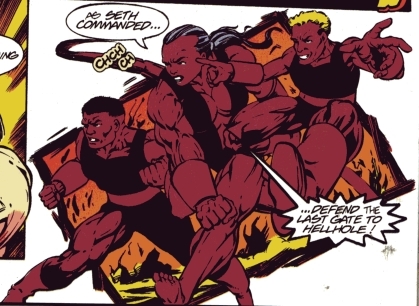 (Official Handbook of the Marvel Universe A-Z#5) - Seth made sure to keep the more powerful Hellbent Primes loyal to himself. (Official Handbook of the Marvel Universe A-Z#5) - At various times, Seth bred with certain Hellbent, allowing his progeny to develop powers of their own. (Marc Spector: Moon Knight#57 (fb) - BTS) - Seth used the Templars to manipulate his heirs into relationships with the concurrent Bloodlines of every generation in hopes of eventually using them to gain access to the Archives. (Web of Spider-Man Annual#9 (fb)) <19 years before the main story> - An unidentified woman left a trio of Hellbent infants (the children of herself and one of the Hellbent Prime) at the doorstep of an Upstate New York monastery that was associated with the Knights Templar. Gregori, the monk who came to the door, recognized them as Hellbent, the tainted legacy of the original Knights Templar. (Web of Spider-Man Annual#9 (fb)) <10 years before the main story> - The three Hellbent -- named Ard, Tia, and Vor -- played within the monastery, continuing under the supervision of Gregori and Lauria. While Gregori treasured them as if they were his own, he recognized their inherent danger and knew that they could never walk free. (Web of Spider-Man Annual#9 (fb)) <4 years before the main story> - While exploring the caverns below the monastery, Ard, Tia, and Vor discovered their powers and inadvertently shattered a wall into an immense library. There they discovered volumes on the Hellbent and learned their true/code names, Shard, Dementia, and Vortex, respectively. Gregori discovered them, shut the book, and told them these volumes were forbidden to them. (Marc Spector: Moon Knight#50 (fb) - BTS) - Seeking the Bloodline to access the Arcane Achives, Seth began using the Hellbent to stage a ruthless coup in the leaderless Templars. (Marc Spector: Moon Knight#47 (fb) - BTS) - Seth gained loyalty from several of the Hellbent by promising to save free them from the Knights Templar's containment. (Marc Spector: Moon Knight#58 - BTS) - After Jean-Paul DuChamp, the Bloodline of the current era, was crippled, Seth decided to make his move. He led his Hellbent Primes to purge the other Knights Templar from the Hellhole. (Marc Spector: Moon Knight#44) - In the caverns beneath an ancient monastery in Western Scotland, a quartet of the Knights Templar (Chretién, Demolay, Lamberton, Seth) discussed the threat to their existence from a traitor from within and how they had entrusted a mere acolyte to retrieve the only weapon they could truly trust (the Bloodline). Seth then revealed himself to be the traitor, and Agony and Basilisk then appeared. Agony, Basilisk, and Seth each slew one of the other Templars, with Seth stating that they were no longer necessary as their sole purpose in life -- guarding the Bloodline -- was fulfilled. (Marc Spector: Moon Knight#48) - Having monitored Chloe's actions via "the Hellbent's eyes and ears throughout the entire city," Agony and Basilisk ambushed Chloe and Jean-Paul as they attempted to enjoy a night out at Club 52, killing two of the club's workers to get their attention. (Marc Spector: Moon Knight#49 (fb) - BTS) - An approaching police car distracted Agony and Basilisk, enabling Chloe and Jean-Paul to escape. Agony and Basilisk presumably slew the cops and stole their car. (Marc Spector: Moon Knight#49 / Marc Spector: Moon Knight#50 (fb) - BTS) - On Wall Street, Agony and Basilisk caught up to Chloe and Jean-Paul and surprised them by emergency from the police car. Jean-Paul stunned them with missiles from his high-tech wheelchair, but then Agony flipped him out of his chair. Chloe, having changed into her Templar guise, then attacked the two Hellbent, and she tricked Basilisk into glancing into the car mirror, his own fatal vision killing him. Chloe then pinched Jean-Paul, stimulating a specific gland in his neck, partially awakening the Bloodline within him. (Marc Spector: Moon Knight#50) - Chloe revealed to Jean-Paul that she was the Templar, telling him of the Hellbent and the Bloodline agenda. Far beneath Castle Chaudron, many Hellbent watched as Seth announced his plans to obtain the Arcane Archives and then sent Bramble, Murmur, and Network to capture Jean-Paul before the Bloodline agenda could be fully consummated. As Network transported the trio to the New York command center, the remaining Hellbent excitedly noted they would soon be freed. Jean-Paul spoke the designated phrase, but the damage to his lower body prevented the process from circulating throughout his entire nervous system. The Hellbent trio then arrived and attacked them. Chloe and Jean-Paul fought back, and when Chloe was injured, the adrenaline catalyzed the Bloodline agenda, and Jean-Paul took the form of his ancestor, 18th century pirate Henri Remont (the Bloodline gene countering Jean-Paul's physical disability with a secondary change). Moon Knight soon arrived and joined the fight, and they overpowered Bramble. Suddenly, the Manx arrived and slew Network, after which Murmur fled. At Phalkoncorp, the newly completed business owned by Seth, Murmur was slain by Agony on his command for his failure; he noted that Agony's previous failure was only tolerated due to her position as Seth's...personal bodyguard. (Marc Spector: Moon Knight#52) - At Phalkoncorp, Seth spoke to his new employee Marlene Alraune regarding his plans for Spectorcorp. Later, Moon Knight encountered Glaze and Cubist in Central Park where they were devouring a horses from a Hansom cab. Moon Knight attacked the pair, driving them off and saving their human victims. (Marc Spector: Moon Knight#53) - Moon Knight, joined by Gambit and the Werewolf (Jack Russell), traveled to Central Park to follow up on the attack by Glaze and Cubist and encountered them, along with Fizzure, Gnash, Lowdown, Tailspin, TKO, and Triplex. The heroes had begun to gain the upper hand when the Manx appeared, slew Gnash, Lowdown, Tailspin, and TKO, then vanished again. Monitoring Marlene from a distance, Agony warned Seth that she suspected something. Seth told her, "Only the truth...we are merely giving Marelene what she truly wants." (Marc Spector: Moon Knight#54) - Moon Knight had his ally Mercy examine Network's corpse, and Mercy noted that some of its enhancements seemed similar to that which Moon Knight faced while infected by a demonic "virus" by Demogoblin. (Web of Spider-Man Annual#9 (fb) - BTS) <The night before the main story> - The Hellbent trio hitched a ride in a truck bound for Manhattan. Seth led a group of Hellbent into the upstate New York monastery and slaughtered the Knights Templar stationed there. (Web of Spider-Man Annual#9) - The Helllbent trio arrived in Manhattan, but a pothole caused their powers to activate, wrecking the truck. With their powers (especially Dementia's) active in the middle of the city, they caused a major commotion, which drew the attention of Spider-Man, the NYPD, and Code: Blue. Eventually, Chloe Tran, who recognized the trio as Hellbent, arrived and calmed Dementia, and Spider-Man formed a web-dome to provide them all a break to regain their composure. Chloe explained their origins, but Spider-Man, while sympathetic, tried to stop them from departing without facing the consequences for their actions. When Code: Blue attacked anew, however, Spider-Man allowed the group to escape. (Web of Spider-Man Annual#9/2) - Chloe accompanied the Hellbent trio back to their former home where they found the corpses of Gregori and the rest of the monks stationed there. While Dementia, Shard, and Vortex dealt with their loss, Chloe checked the Archives and was surprised to find that even the back-up files on the trio were incomplete. (Web of Spider-Man Annual#9/2 - BTS) - Chloe took the Hellbent trio to an apartment room behind an abandoned facade and false walls in a seemingly dead tenement just south of the Manhattan riverfront's Alphabet City (her own privately-secured sanctuary, purchased via the Templar's "black account" set up shortly after her initiation and known only to her). (Official Handbook of the Marvel Universe A-Z#5) - Seth plotted to kill and replace his alleged descendent Marc Spector/Moon Knight, the head of Spectorcorp, using their remarkable physical similarity. 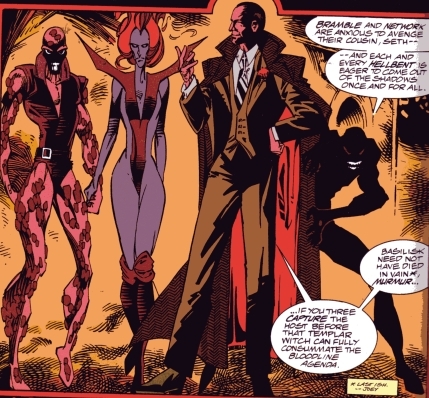 (Official Handbook of the Marvel Universe A-Z#5) - Seth also recruited Spector's brother, Randall, into the Hellbent as Nightshadow. (Marc Spector: Moon Knight#55 (fb) - BTS) - Despite suspecting that Seth was using her to get Spectorcorp, Marlene purchased controlling interests in Spectorcorp for Seth. (Marc Spector: Moon Knight#55) - When Spectorcorp security agents Nicolai Cray & Raul Cruz attempted to investigate the goings-on at Phalkoncorp, but Seth discovered them, slew Cray, and left Cruz a hysterical mess. Meanwhile, within Chloe's abandoned apartment, Flare and Agony tortured Jean-Paul, seeking to force him to reveal Chloe's location. The pain eventually activated the Bloodline link and he transformed into his psychopathic grandfather, Pierre Latrec, who swiftly beat Flare to death then tore Agony's hair off before escaping with her. Mistaking Seth for his virtual look-alike, Marc Spector, Jean-Paul later uploaded information to Phalkoncorp, granting Seth access to Shadowkeeps's security codes. Following up on Cray's death and Cruz's madness, Moon Knight broke into Phalkoncorp and was confronted by Seth; Moon Knight was shocked at how similar Seth's appearance was to Marc Spector. (Web of Spider-Man Annual#9/2) - Weeks later, Chloe tried to console Dementia, who remained virtually unresponsive. Meanwhile, Shard and Vortex continued to train against each other on the roof. The upset with their behavior, Chloe was proud of their progress and hoped that they'd be able to walk the streets of New York with impunity soon, IF she could activate the Bloodline Agenda before Seth. Commenting that Dementia was continuing to improve, Shard and Vortex discussed their plans to find their mother, noting only that they had a name and a 20-year old address. (Marc Spector: Moon Knight#56) - After a short battle, Seth tried to absorb Moon Knight's life force, only to be blasted back by bio-feedback. Moon Knight and Seth separated as each recovered. Later, as Marlene finished transferring her Spectorcorp holdings to Phalkoncorp, Seth confronted and assaulted Marlene (I can't really figure out why, because no longer needed her, but he talked about discovering what she was doing on the computer, when she was helping him...). While Seth overpowered Moon Knight and prepared to throw him off the roof, Marlene shot Seth with stinger missiles from Moon Knight's Angelwing ship. Moon Knight recovered, stunned Seth, and pinned him to a wall, but was then transported away by the Goddess to serve in her Infinity Crusade. The Hellbent Prime known as Hook then arrived, freed Seth, and escaped. Chloe continued to train the Cadre. Jean-Paul used truth serum in an effort to gain information from Agony. (Marc Spector: Moon Knight#57 (fb) - BTS) - Stealing Moon Knight's Angelwing, Hook flew Seth towards the Hellhole. Jean-Paul obtained the Hellhole's location from Agony, loaded her into a ship, and flew her in that location. (Marc Spector: Moon Knight#57) - With the info he had gained from Agony, Jean-Paul flew himself and Agony towards the Hellhole over the Brazilian Amazon rain forest, but Agony taunted him until he lost control, activating the Bloodline and transforming him into Henri Remont, an 18th century pirate. Agony escaped via parachute while the ship crashed, though Remont gained enough control to prevent the crash from being fatal. As Seth arrived at a "time-lost temple to long-abandoned Gods of Blood," he needed life force to heal himself. Hook volunteered himself, but Agony arrived and insisted that she should make the sacrifice to redeem her; Seth accepted and drained her entire life force, killing her. Seth and Hook then entered Seth's computer room, deactivated the holo-wall, and accessed the last gate to Hellhole. The Manx ambushed Chloe and the Cadre, briefly battling them, but Chloe convinced him that the Cadre were not rogues like those serving Seth, and he joined them in taking the hunt to Hellhole. (Marc Spector: Moon Knight#58) - Sent to the Hellhole by the Space Gem at the conclusion of the Infinity Crusade, Moon Knight was confronted by an army of Hellbent who attacked him as an invader. Not wishing to hurt them, he fled deeper into Hellhole. Meanwhile, riding in his armored micro-tank, Jean-Paul DuChamp broke into the temple's antechamber and swiftly dispatched a trio of Hellbent Prime: Krunch, Ripper, & Vault. His entrance was then used by the Cadre and Chloe to enter the temple as well. As he continued down the temple's tunnels, Jean-Paul next was confronted by Seth, alongside Arc, Bass, Belle, Crackdown, Dusk, Hook, Lava, and Spike. After some battle, Hook shattered the mini-tank's dome and pulled out Jean-Paul, who again turned into Pierre Latrec upon being confronted by Seth, as Seth had intended. As the Cadre and Chloe arrived and occupied the Hellbent Prime, Pierre followed his Bloodline directive, heading for the Arcane Archives. Hiding in the shadows via Dusk, Seth followed his trail. As Hook followed Seth, Chloe and the Cadre followed him; meanwhile the Hellbent Omegas took the arrival of a Templar (Chloe) as a sign that they could finally take back Hellhole. Moon Knight encountered Pierre, not knowing who he was, and sought answers, but the insane Latrec --his strength apparently enhanced by his proximity to the Archives -- attacked him, beating him savagely. Facing imminent death, Moon Knight desperately and unwittingly unleashed his own Hellbent power, draining Latrec's life force. Jean=Paul regained his true form, seemingly dead at Moon Knight's hands, though really only stunned by the loss of one of the Bloodline components. (Marc Spector: Moon Knight#59) - While Moon Knight was devastated by having seemingly slain his old friend Jean-Paul, Seth believed that Moon Knight was theirs for the taking. Hook and Spike then arrived, closely pursued by the Cadre, Chloe Tran, and the Manx, and the two Hellbent forces fought. Some distance away, Nightshadow encouraged Ripper as he savagely beat and then apparently slew one of the conventional Hellbent for refusing to go into the pens (where the Hellbent said he would have served as fodder for Seth. Slime spoke out against Nightshadow, accusing the so-called "Hellbent Primes" of having risen from the shadows and seized power. 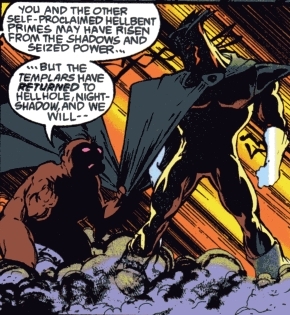 Slime proclaimed that the Templars had returned to Hellhole, but Nightshadow drained Slime's life force, killing him as Nightshadow proclaimed that while his loyalty to his new Hellbent family (and his personal savior from the light) is recent, that it was absolute. The Manx dove at Dusk, but Seth swatted him back, telling him that Dusk was, now and forevermore, the most special of his chosen. Naming Dementia's perceptual distortion powers as the most dangerous, Seth knocked her out next, then told Dusk to retreat to the shadows while he approached the Bloodline. As Chloe used the Bloodline nerve cluster to shut down the chemical relays between Latrec and Duchamp, saving the latter's life, Moon Knight attacked Seth. 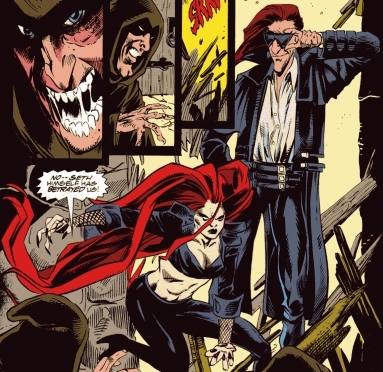 News that the Bloodline host still lived, combined with the presence of the Templar, inspired the Hellbent to rise up against the Hellbent Primes who would exterminate them, and Nightshadow, Ripper, and Vault found themselves outnumbered 50-to-1, though Nightshadow bragged that they'd simply pile the powerless carcasses high. As Dementia affected Hook's perceptions, Spike nailed Vortex with some of his psycho-quills, and the Manx then savagely attacked Hook. Spike, noting his own immunity to Dementia's powers, realized that he was the Cadre's long-lost father. Moon Knight caught up to Seth as he prepared to enter the Arcane Archives, following him in, and the remaining Hellbent then rushed in. When Nightshadow began draining Shard's life force, Spike revealed his parental relationship to the Cadre and tackled Nightshadow from behind. Nightshadow turned his power on Spike (possibly killing him), but Chloe separated them and then headed after Jean-Paul, who was crawling towards the Arcane Archives; and Nightshadow instructed Dusk and Hook to follow him after them as well to find Seth. Seth was furious to find a giant mirror as the only evidence of the Arcane Archives, and Moon Knight used his distraction to attack him anew. As they fought, Jean-Paul reached the mirror, which he revealed to be a true looking lass straight into the core of the soul. It allowed him to focus on his full Bloodline potential, gaining the collected knowledge of his ancestors, each of whom had devoted the last years of his or her life memorizing the original documents. Jean-Paul noted that this cavern alone hid 36, 535 lost scrolls of Thoth containing the Egyptian legends of creation, and Seth the grabbed him, preparing to drain his life force and gain his knowledge. Moon Knight pulled Seth off and, guided by Jean-Paul's advice that Seth truly could not die, bound Seth in Adamantium and cast him deep into the caverns. The violent battles within Hellhole had triggered the fragile magma faults below it, and Hellhole began to rumble. Jean-Paul guided Moon Knight, Chloe, and the Cadre through a Hellgate. Noting that the heroes would not escape them, Nightshadow joined Hook and Dusk in escaping, possibly via accessing one of the teleportals as well, though Hook noted that they could not leave Seth behind. The rest of the Hellbent lamented the departure of their saviors and the shattering of the Archives but were pleased with Seth being buried alive. Some of them took note of the teleportals as lava began to erupt everywhere, and Hellhole was swiftly consumed by the lava and flames. (Marc Spector: Moon Knight#60 (fb) - BTS) - The explosive exit from Hellhole shattered the Hellgate into smaller teleportals accessing a myriad of other target locations around the world, offering last minute deliverance to any number of doomed and desperate Hellbent during the final collapse of their ancient lair. (Marc Spector: Moon Knight#60) - Moon Knight, Chloe, and the Cadre emerged from the Hellgate, arriving in the Spectorcorp building, and the Manx swiftly departed. Marlene revealed how she had saved Spectorcorp from Phalkoncorp, and Jean-Paul thanked Chloe for helping him achieve his birthright. The Cadre voiced their plans to find their mother, as well as to seek out and help other homeless Hellbent survivors in New York until they found her. Dusk, Hook, and Nightshadow emerged as well, possibly from the same portal, but Dusk shrouded their escape, and they quickly regrouped on a separate rooftop. Nightshadow commented that they had left Seth buried alive but insisted on first gaining vengeance on Moon Knight before returning to Hellhole. Hook noted that Seth lived on, in more ways than they could know. When Moon Knight attempted to purge his computers of Seth's influence, he instead activated Zero Hour, an extremely contagious computer plague controlled by a simulacrum of Seth. It was designed to infect every key system Shadowkeep was networked to and then to all systems linked to them, and then self-destructing, destroying them all. With no way to deactivate the virus, Moon Knight cleared everyone else out from the room and then activated his Ground Zero contingency plan, which exploded the central computer bank and seemingly killed Moon Knight as well. (X-Man#47 (fb) - BTS) - A group of Hellbent the "last of the night-tribes," established a home on an island in the Caribbean that became known as the Nest. They believed themselves to be the last of the surviving Hellbent. (X-Man#39) - Ness/Witness shared a precognitive flash with Nate Grey of Grey's powers destroying a large portion of Earth (as happened on Earth-9806). In the Nest (an island hidden by seething seas and tropical storm clouds), Ness awoke in a sweat. Because of his observation of this future, Ness would become known as the Witness. He left his sleeping wife and took their motor boat, heading North towards Nate Grey. (X-Man#40) - Ness arrived in the Arctic Circle at an immense crater created by Nate Grey as he drove the Great Beasts off of Earth, sensing the powerful energies Grey had unleashed. (X-Man#41) - Ness followed Nate Grey's trail away from the crater. En route, he used a large ice drill to stop the armored warriors of Gauntlet from telepathically ripping information on Grey from a Morelle Pharmaceuticals base nearby. Surrounded by Gauntlet, Nate bluffed them into believing he was transmitting a live image through his personal satellite to the major media networks. Unwilling to have their existence publicly exposed, Gauntlet teleported away. Ness started to ask those he'd saved if they had information on Nate Grey, but he was distracted by a distinctive metal shard, which he obliterated with an energy gun. After finding out where they had found it and assuring that none of the others had touched it ("know the taint of the Shasteel"), he departed. (X-Man#42) - Ness tracked Nate Grey to the western coast of Ireland and confronted him at last. They were swiftly separated as Nate had to leave to generate a rain storm to put out a fire caused by Blaquesmith's Tech-Gnomes. Ness joined Madelyne Pryor in rushing to check on Nate after he exhaustedly crashed to the ground, but they were surprised to find him gone. (X-Man#43) - In Dublin, Ness lamented having lost his family and his people, noting that his only purpose in life was as the Witness to a future that could end the world. He was left with only a fragment of a Tech-Gnome and some soil to use to track Nate. (X-Man#44 (fb) - BTS) - Ness tracked Nate to New York City. (X-Man#44) - Ness spoke to his Hellbent cousin Slaine, noting that he had lost track of Nate Grey again, and that there were other powerful beings after Nate. He asked Slaine to get his people to help him, and Slaine agreed that he owed Ness just enough to try; Slaine further noted that Ness had the stink of humanity on them and that he would never be allowed to return to the Nest. (X-Man#45) - In the New York sewers, Ness met with Slaine, who told him that neither he nor any of the Hellbent knew anything the Tech-Gnome technology he had obtained. Before Slaine could say anything further, he was attacked from behind by the Manx who was accompanied by the Shadow-Sisters, Dusk and Dawn. Dawn noted that Slaine had led them straight to his fellow traitor and then released a burst of light to stun Ness who instead took advantage of the distraction to leap onto the ceiling. Ness then tackled Dawn and threatened to snap her neck unless Dusk called off the Manx. Dusk said that the man answered to no one, but then Slaine used the last of his strength to skewer the Manx, apparently killing it. Slaine encouraged Ness to slay Dusk, but she then teleported away with Dawn, presumably returning to the Nest. With his dying breath, Slaine told Ness that he had identified the location from which the Tech-Gnome had been grown, the small Philippines island Tramahoi. (X-Man#46) - Ness arrived in Tramahoi and entered Blaquesmith's ship, intending to get answers about Nate Grey. (Cable I#63) - As Ness confronted Blaquesmith, Blaquesmith set off his ship's self-destruct mechanism and they rushed outside. Blaquesmith then told Ness that Nate was in Latveria fighting Stryfe. (X-Man#47 (fb) - BTS) - Blaquesmith flew Ness to Latveria in another ship. (X-Man#47) - As some of Latveria's border nations tried to prevent Latverians from fleeing during Stryfe's assault, Ness took advantage of the distraction to slip INTO Latveria. He noted that he was less than impressed with the future that Blacquesmith represented, and he prepared to prevent Nate from causing the destruction they had foreseen. Ness entered Sryfe's castle, following shortly behind Nate and Cable and noting that things were proceeding exactly as he had foreseen. When Nate rallied his power, preparing to sacrifice himself to stop Stryfe, Ness rushed forward, explaining that if Nate's final power outburst occurred there, it would combine with Stryfe's accumulated power and create a wave that would destroy half the planet. Nate instead levitated Dr. Doom's power siphon device atop Stryfe. As Nate grabbed Ness and fled, the device kept draining Stryfe's power and feeding it back into him until it overloaded and blew up. As they met with Madelyne and Cable, Ness noted that his and Nate's destinies were linked, and Nate would understand why in time. (X-Man#49) - Back in Dublin, Ness sat atop a church, pondering his future as an exile of the Nest. Madelyne Pryor appeared behind him, but he sensed her presence before she spoke. Madelyne accused Ness of worming his way into Nate's life and driving Nate out. Ness told her that knowing any more about Nate's past (beyond his being an exile of the Hellbent Nest) would endanger both Madelyne and Nate. He further questioned what exactly Madelyne was. (X-Man#50) - Madelyne appeared with a knife over the sleeping Ness. He sensed her presence and told her he knew she was there, and she responded that she knew he knew before she vanished again. (X-Man#51) - As Strikeforce: Gauntlet confronted Nate and Madelyne in the MacAleer's house in Dublin, Ness watched from above, noting that one of the Gauntlet agents wasn't what he or she appeared to be. When the armored agents began attacking, Ness leapt down and joined the fight. The Gauntlet agents' armor proved immune to psionic attack, and Ness saved a pair of civilians from collapsing architecture, but Gauntlet's unarmed commander Scanlon grabbed Ness and held him in a headlock. When the ceiling collapsed as Nate fought Gauntlet, Ness took advantage of the distraction to free himself from Scanlon's grip, then saved Scanlon from falling to the next level. Learning of the extent of the operation from Scanlon, Ness tried futilely to get Nate to leave, but Nate continued to fight. After pulling Scanlon to safety, Ness leapt atop Gauntlet agent G-2, pummeling her, while Madelyne cracked G-1/Barone's psi-fields and then Nate tore the armor open. Two dozen or more Gauntlet agents then arrived to continue the struggle. (X-Man#52) - Ness convinced Madelyne not to teleport Nate away, as Gauntlet would find him again and more innocents would be hurt in the process; he then tackled another of the Gauntlet members. After Gauntlet stunned Madelyne, Ness had Nate bury her under a protective wall of debris. After Gauntlet agent Vise usurped control of Gauntlet, Cinder Fontaine flattened much of the rest of the group, and Ness and Nate teamed up with her to take out the others. Ness vowed to protect Madelyne and then blast her out when it was safe. Nate drew away most of the Gauntlet agents, and Ness led the remaining ones awy from Madelyne. As Nate and Fontaine took out Gauntlet's ship, Ness blasted open the material surrounding Madelyne but found that she had already vanished. Vise then ambushed Ness, preparing to crush him before teleporting away and leaving everything to be destroyed by a nuclear explosion, but Nate then dropped the Gauntlet ship on them. The explosion was contained (or neutralized) by the ship, and Madelyne stood over Ness' apparently dead body, noting that she could have saved him but had other things on her mind as her plans had recently changed. Comments: Created by Terry Kavanaugh, Gary Kwapisz, and Jimmy Palmiotti. They are actually first referred to as the Hell-Bent in Marc Spector: Moon Knight#44. I'm really not sure what the deal with the Hellbent Prime is. Nightshadow calls the regular Hellbent "half-bloods," but Nightshadow was supposed to have been Randall Spector, who was obviously the son of two seemingly human parents. As far as I can tell, pretty much all of the Hellbent known by name and serving Seth (with the exception of Slime (and possibly Misery, see below) are Hellbent Prime. The Cadre are supposed to be from a human mother, so that would make them NOT Prime. The ones from the Central Park battle (Cubist, Fizzure, Glaze, Gnash, Lowdown, Tailspin, TKO, and Triplex) were not specifically affiliated with Seth and may not be Primes. However, the only ones 100% defined as Primes are Hook, Krunch, Nightshadow, Ripper, and Vault...and presumably Dawn & Dusk. The Cadre, Ness, Seth the Immortal, and probably the Knights Templar will get their own profiles in the near future...relatively near, anyway, as soon as I have a chance to get to them. Misery is identified as one of the Hellbent in the OHotMU A-Z 2006 profile, but I don't see anyone identified as Misery in the comics. I'd have to guess that Misery is the unidentified Hellbent that Ripper beat to death with Nightshadow's encouragement in Marc Spector: Moon Knight#59. And WTF were the Hellbent Omegas? Seth has a mini-profile in Marc Spector: Moon Knight#58, and the Cadre and the Manx have similar profiles in #57, all taken from the notes of Chloe Tran. Dusk (Cassie St. Commons) - Slingers, ESU student, rich goth wf from Connecticut, given costume of Dusk of the Negative Zone by Black Marvel, receives power from Negative Zone, apparently fell to death and revived. Agony (female, red hair) could manipulate her hair, using it as a weapon. Basilisk (male) could psychically kill anyone viewing his exposed eyes...even via reflection...even himself. (Marc Spector: Moon Knight#44) - Under Seth's guidance, Agony & Basilisk appeared in the caverns beneath an ancient monastery in Western Scotland, attacking three of the Knights Templar (Chretién, Demolay, Lamberton) who were meeting with Seth. Agony, Basilisk, and Seth each slew one of the other Templars..
(Marc Spector: Moon Knight#47) - Agony and Basilisk climbed out of the Hudson River and ambushed the Knights Templar acolyte Chloe Tran as she prepared to contact Jean-Paul DuChamp to bring him over into his Bloodline heritage. Basilisk slew a passerby who observed them, and Agony attacked Chloe who was wounded and escaped down a manhole. (Marc Spector: Moon Knight#49 / Marc Spector: Moon Knight#50 (fb) - BTS) - On Wall Street, Agony and Basilisk caught up to Chloe and Jean-Paul and surprised them by emergency from the police car. Jean-Paul stunned them with missiles from his high-tech wheelchair, but then Agony flipped him out of his chair. Chloe then attacked the two Hellbent, and she tricked Basilisk into glancing into the car mirror, his own fatal vision killing him. Chloe then pinched Jean-Paul, stimulating a specific gland in his neck, partially awakening the Bloodline within him. (Marc Spector: Moon Knight#50) - Per Seth's command, Agony slew Murmur for his failure; Seth noted that Agony's previous failure was only tolerated due to her position as Seth's...personal bodyguard. (Marc Spector: Moon Knight#54) - Seth sent Agony and Flare to eliminate Chloe Tran to prevent her from interfering with Seth's mission of obtaining the Bloodline. Even as the two Hellbent confronted Jean-Paul, Chloe departed, deciding that Jean-Paul must be able to save himself. (Marc Spector: Moon Knight#55) - Within Chloe's abandoned apartment, Flare and Agony tortured Jean-Paul, seeking to force him to reveal Chloe's location. The pain eventually activated the Bloodline link and he transformed into his psychopathic grandfather, Pierre Latrec, who swiftly beat Flare to death then tore Agony's hair off before escaping with her. (Marc Spector: Moon Knight#56) - Jean-Paul used truth serum in an effort to gain information from Agony. (Marc Spector: Moon Knight#57 (fb) - BTS) - Jean-Paul obtained the Hellhole's location from Agony, loaded her into a ship, and flew her in that location. As Seth arrived at a "time-lost temple to long-abandoned Gods of Blood," he needed life force to heal himself. Hook volunteered himself, but Agony arrived and insisted that she should make the sacrifice to redeem her; Seth accepted and drained her entire life force, killing her. Agony may have been Seth's lover, but it was never specified. Arc projected bio-electrical surges from his eyes. Bass and Belle had vibratory/frequency powers with Bass producing low frequency and Belle producing high frequency. Crackdown was large & super-strong. Spike fired spikes that released a psycho-active drug into their target. (Marc Spector: Moon Knight#58) - Within Hellhole, Seth -- alongside Arc, Bass, Belle, Crackdown, Dusk, Hook, Lava, and Spike -- confronted Jean-Paul DuChamp as he continued down the temple's tunnels in his mini-tank. Arc disabled the shields on Jean-Paul's mini-tank, while Bass and Belle's alternating frequencies weakened its dome. Jean-Paul's mini-tank's weapons systems incapacitated several of his attackers, including flattening Crackdown with a hydraulic ram, binding Lava in a coil, shooting one of them (maybe Arc) with its machine gun, and blasting Bass & Belle with an energy weapon. Hook, however, then shattered the mini-tank's dome, pulled out Jean-Paul, and handed him over to Seth. Jean-Paul again turned into Pierre Latrec, as Seth had intended. The Cadre and Chloe then arrived and fought the Hellbent Prime. Spike prepared to try to drug Latrec, but Seth stopped him, wanting Latrec to lead him to the Arcane Archives. Spike then went after Dementia but missed as she distorted his perceptions and instead drugged Crackdown, deranging him, and Crackdown smashed Arc, knocking him out. Dementia's powers sent Lava flying out of control, and Vortex (who was immune to Dementia's powers) generated a wind burst that smashed Spike into a wall. Shard finished off Crackdown, and then the Manx took out Bass & Belle. (Marc Spector: Moon Knight#59) - Hook and Spike joined Seth and Dusk behind Moon Knight, and they were closely pursued by the Cadre, Chloe Tran, and the Manx, and the two Hellbent forces fought. The Manx dove at Dusk, but Seth swatted him back, telling him that Dusk was, now and forevermore, the most special of his chosen. Naming Dementia's perceptual distortion powers as the most dangerous, Seth knocked her out next, then told Dusk to retreat to the shadows while he approached the Bloodline. Spike, noting his own immunity to Dementia's powers, realized that he was the Cadre's long-lost father. When Nightshadow began draining Shard's life force, Spike revealed his parental relationship to the Cadre and tackled Nightshadow from behind. Nightshadow turned his power on Spike (possibly killing him), but Chloe separated them and then headed after Jean-Paul, who was crawling towards the Arcane Archives; and Nightshadow instructed Dusk and Hook to follow him after them as well to find Seth. Dusk gets an entry in a later sub-profile alongside her sister Dawn. Network could form nets to entrap others and/or to teleport himself and others. (Marc Spector: Moon Knight#50) - Seth announced his plans to obtain the Arcane Archives and then sent Bramble, Murmur, and Network to capture Jean-Paul before the Bloodline agenda could be fully consummated. As Network transported the trio to the New York command center, the remaining Hellbent excitedly noted they would soon be freed. Jean-Paul spoke the designated phrase, but the damage to his lower body prevented the process from circulating throughout his entire nervous system. The Hellbent trio then arrived and attacked them. Chloe and Jean-Paul fought back, and when Chloe was injured, the adrenaline catalyzed the Bloodline agenda, and Jean-Paul took the form of his ancestor, 18th century pirate Henri Remont (the Bloodline gene countering Jean-Paul's physical disability with a secondary change). Moon Knight soon arrived and joined the fight, and they overpowered and subdued Bramble. Suddenly, the Manx arrived and slew Network, after which Murmur fled. At Phalkoncorp, the business owned by Seth, Murmur was slain by Agony on Seth's command for his failure; Seth noted that Agony's previous failure was only tolerated due to her position as Seth's...personal bodyguard. I'm really not sure what happened to Bramble. Cubist's pheromones distort other's visual perceptions. Fizzure could form a hole in his own flesh to allow attacks to pass through him unharmed, and he could also close these openings around others, trapping their limbs. Glaze generated an adhesive slime with which he could coat others, binding them or adhering them to other surfaces. Gnash had mouths for hands. Lowdown was short and super-strong. TKO could punch at super-speed. (Marc Spector: Moon Knight#52) - Moon Knight encountered Glaze and Cubist in Central Park where they were devouring a horses from a Hansom cab. Moon Knight attacked the pair, driving them off and saving their human victims. (Marc Spector: Moon Knight#53) - Moon Knight and the Werewolf (Jack Russell) traveled to Central Park to follow up on the attack by Glaze and Cubist and encountered them, along with Fizzure, Gnash, Lowdown, Tailspin, TKO, and Triplex. Werewolf shattered Gnash's teeth but was then grabbed by Triplex. 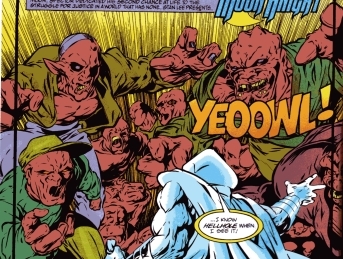 When Moon Knight tried to launch crescent darts at Cubist, he missed due to Cubist's distortion effect, but when Lowdown slammed into Moon Knight, more darts were launched into Triplex, freeing the Werewolf, and knocking Triplex into TKO, who was unable to stop herself from pummeling Triplex into submission. Aiming for the center of the distortion effect, Moon Knight took out Cubist with his truncheon, but then Glaze slimed Moon Knight and Werewolf's feet, sticking them to the ground. The Hellbent began to attack them, but then Gambit arrived and broke the heroes free. Werewolf slashed Glaze, flattening her, and Moon Knight pinned Tailspin's tail to a tree. Attacking Fizzure simultaneously, Gambit caught him in a solid spot and stunned him with a burst of kinetic energy. 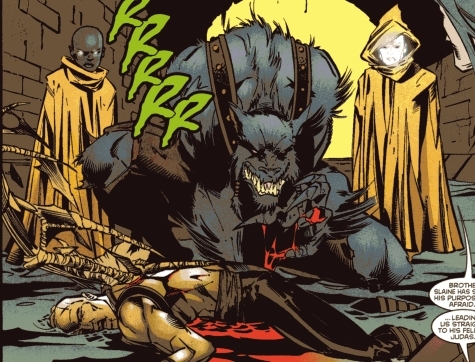 Werewolf slashed off Tailspin's tail, and Gambit used his staff to break TKO's wrists, when suddenly the Manx appeared, slew Gnash, Lowdown, Tailspin, and TKO, then vanished again. I'm not sure that these eight were Hellbent Prime or actually agents of Seth. I'm not sure what Cubist, Fizzure, Glaze, & Triplex's fates were. The Manxes were savage, feral creatures, striking suddenly and often fatally from the shadows, then swiftly disappearing into the shadows again. They had superhuman strength (enhanced human), speed, agility, and presumably olfactory senses and nocturnal vision (via seeing into the infra-red spectrum), plus razor-sharp teeth and claws. They were also known as Hellbent-stalkers. Dusk and Dawn, also known as the Sisters and the Shadow-Sisters, could teleport and generate shadows (Dusk) or blinding light (Dawn). (Official Handbook of the Marvel Universe A-Z#5) - Over time, some of the Hellbent occasionally escaped the Hellhole, which was both shelter and prison. To combat these rogues, the Knights bred the Manx. (Marc Spector: Moon Knight#57 (fb) - BTS) - The Manxes were bred from pure Hellbent Prime stock long centuries ago by the Templars to hunt down their own tainted breed. (Marc Spector: Moon Knight#57 (fb) - BTS) - Even when the 13th generation Manx went rogue, the Templars continued to use the hunter's bloodthirsty reputation to control all Hellbent who would stray form their flock. (Marc Spector: Moon Knight#50 - BTS) - The Manx tracked Moon Knight to a church in which Chloe and Bloodline/Jean-Paul DuChamp/Henri Remont were battling Bramble, Murmur, and Network. (Marc Spector: Moon Knight#50) - After Bramble was defeated, the Manx arrived and slew Network, after which Murmur fled. The Manx told Bloodline that he had saved his life this time, but that his full trial by fire was yet to come. Moon Knight tried to follow the Manx out through a hole in the ceiling, but the Manx was long gone. (Marc Spector: Moon Knight#53) - While Gambit, Moon Knight and the Werewolf (Jack Russell) battled Cubist, Fizzure, Glaze, Gnash, Lowdown, Tailspin, TKO, and Triplex in Central Park, the Manx appeared, and slew Gnash, Lowdown, Tailspin, and TKO. Warning the heroes that their city and their world were infested with the Hellbent, the Manx vanished again. Even Werewolf couldn't find his scent. (Marc Spector: Moon Knight#57) - The Manx ambushed Chloe and the Cadre, briefly battling them, but Chloe convinced him that the Cadre were not rogues like those serving Seth, and he joined them in taking the hunt to Hellhole. (Marc Spector: Moon Knight#58) - Within Hellhole, Seth -- alongside Arc, Bass, Belle, Crackdown, Dusk, Hook, Lava, and Spike -- confronted Jean-Paul DuChamp as he continued down the temple's tunnels. After some battle, Hook captured Jean-Paul, who again turned into Pierre Latrec upon being confronted by Seth, as Seth had intended. As the Cadre and Chloe arrived and occupied the Hellbent Prime, Pierre followed his Bloodline directive, heading for the Arcane Archives. Hiding in the shadows via Dusk, Seth followed his trail. While the two Hellbent forces battled, Manx took out Bass & Belle. (Marc Spector: Moon Knight#59) - Hook and Spike joined Seth and Dusk behind Moon Knight, and they were closely pursued by the Cadre, Chloe Tran, and the Manx, and the two Hellbent forces fought anew. As Dementia affected Hook's perceptions, Spike nailed Vortex with some of his psycho-quills, and the Manx then savagely attacked Hook, and Spike's psycho-quills only made the Manx more savage. Nightshadow instructed Dusk and Hook to follow him in pursuit of Chloe and Jean-Paul to find Seth. Moon Knight and his allies subdued Seth, but the violent battles within Hellhole had triggered the fragile magma faults below it, and Hellhole began to rumble. Jean-Paul guided Moon Knight, Chloe, and the Cadre through a Hellgate. (Marc Spector: Moon Knight#60) - Moon Knight, the Manx, Chloe, and the Cadre emerged from the Hellgate, arriving in the Spectorcorp building, and the Manx swiftly departed. (X-Man#45 (fb) - BTS) - Dawn and Dusk apparently came to dwell in the Nest, and the Manx (either the same one as from before or another) joined them as their warrior. (X-Man#45) - Accompanied by the Shadow-Sisters, Dusk and Dawn, the Manx ambushed Slaine in the New York sewers. Dawn noted that Slaine had led them straight to his fellow traitor and then released a burst of light to stun Ness who instead took advantage of the distraction to leap onto the ceiling. Ness then tackled Dawn and threatened to snap her neck unless Dusk called off the Manx. Dusk said that the Manx answered to no one, but then Slaine used the last of his strength to skewer the Manx, apparently killing it. Slaine encouraged Ness to slay Dusk, but she then teleported away with Dawn, presumably returning to the Nest (per Slaine's suspicion). Flare could project heat blasts. (Marc Spector: Moon Knight#54) - Seth sent Agony and Flare to eliminate Chloe Tran to prevent her from interfering with Seth's mission of obtaining the Bloodline. Even as the two Hellbent confronted Jean-Paul, Chloe departed, deciding that Jean-Paul must be able to save himself. Hook was large, super-strong, possessed sharp talons and horns, and could fly via bat-like wings, carrying at least one full grown man aloft. (Marc Spector: Moon Knight#56) - After Moon Knight had been transported away by the Goddess following his defeating and capturing Seth, Hook arrived, freed Seth, and escaped. (Marc Spector: Moon Knight#57) - As Seth arrived at a "time-lost temple to long-abandoned Gods of Blood," he needed life force to heal himself. Hook volunteered himself, but Agony arrived and insisted that she should make the sacrifice to redeem her; Seth accepted and drained her entire life force, killing her. Seth and Hook then entered Seth's computer room, deactivated the holo-wall, and accessed the last gate to Hellhole. (Marc Spector: Moon Knight#58) - Riding in his armored micro-tank, Jean-Paul DuChamp broke into the temple's antechamber and continued down the temple's tunnels, Jean-Paul next was confronted by Seth, alongside Arc, Bass, Belle, Crackdown, Dusk, Hook, Lava, and Spike. After some battle, Hook shattered the mini-tank's dome and pulled out Jean-Paul, who again turned into Pierre Latrec upon being confronted by Seth, as Seth had intended. As the Cadre and Chloe arrived and occupied the Hellbent Prime, Pierre followed his Bloodline directive, heading for the Arcane Archives. Hiding in the shadows via Dusk, Seth followed his trail. As Hook followed Seth, Chloe and the Cadre followed him. Hook attacked the Cadre. As Dementia affected Hook's perceptions, Spike nailed Vortex with some of his psycho-quills, and the Manx then savagely attacked Hook, and Spike's psycho-quills only made the Manx more savage. Nightshadow later instructed Dusk and Hook to follow him in pursuit of Chloe and Jean-Paul to find Seth. Krunch (female), Ripper (dark haired male), & Vault (blond-haired male) each had super-strength. (Marc Spector: Moon Knight#58) - Guarding the temple's antechamber above the Hellhole, Krunch, Ripper, & Vault confronted Jean-Paul DuChamp as he broke in in his armored micro-tank. They were also swiftly dispatched by his tank's energy shield. (Marc Spector: Moon Knight#59) - Nightshadow encouraged Ripper as he savagely beat and then apparently slew one of the conventional Hellbent for refusing to go into the pens (where the Hellbent said he would have served as fodder for Seth. Slime spoke out against Nightshadow, accusing the so-called "Hellbent Primes" of having risen from the shadows and seized power. Slime proclaimed that the Templars had returned to Hellhole, but Nightshadow drained Slime's life force, killing him as Nightshadow proclaimed that while his loyalty to his new Hellbent family (and his personal savior from the light) is recent, that it was absolute. Moon Knight caught up to Seth as he prepared to enter the Arcane Archives, following him in, and the remaining Hellbent then rushed in to the battle between Seth's forces and the Cadre & Manx. As far as I could tell, Krunch only was seen in the fight with DuChamp, though she may have been alongside Ripper, Vault, & Nightshadow in battling the regular Hellbent army. Nightshadow was the only one seen to make it out of that battle. Krunch, Ripper, and Vault may have died in that battle or perished in the destruction of Hellhole, though its also possible they escaped through one of the teleportals. These three were the least interesting of the Hellbent. Nightshadow, like Seth, could drain life force from others on contact, using it to fuel his own power. He presumably had some degree of super-strength and durability. Slime did not demonstrate any superhuman abilities. Moon Knight caught up to Seth as he prepared to enter the Arcane Archives, following him in, and the remaining Hellbent then rushed in to the battle between Seth's forces and the Cadre & Manx. When Nightshadow began draining Shard's life force, Spike revealed his parental relationship to the Cadre and tackled Nightshadow from behind. Nightshadow turned his power on Spike (possibly killing him), but Chloe separated them and then headed after Jean-Paul, who was crawling towards the Arcane Archives; and Nightshadow instructed Dusk and Hook to follow him after them as well to find Seth. (Marc Spector: Moon Knight#60) - Moon Knight, Chloe, and the Cadre emerged from the Hellgate, arriving in the Spectorcorp building, and the Manx swiftly departed. This entry only deals with Nightshadow, and does not cover Randall Spector beyond his Hellbent appearances. Slaine could fly via his wings, which had large spikes that could be used to impale even a superhumanly powerful being such as the Manx. (X-Man#44) - Ness spoke to his Hellbent cousin Slaine, noting that he had lost track of Nate Grey again, and that there were other powerful beings after Nate. He asked Slaine to get his people to help him, and Slaine agreed that he owed Ness just enough to try; Slaine further noted that Ness had the stink of humanity on him and that he would never be allowed to return to the Nest.